Oh, Baby, your work takes my breath away. What gorgeous shade of blue. And I bet it feels really good to have your hands back in the clay and your foot on the wheel (or electrical switch). P.S. Does this mean more contests with giveaways? 😉 Not because I’m really good at them or anything. Oooh! Gorgeous! I love the square plates and the bowl with the circles! Blue is my favorite color and I love those creations! Oooohhhh, simply gorgeous! I love the blue. It has such color and depth. Very nice! We are headed to the Sugarloaf craft festival this weekend to replenish our supply. We lose a couple a year, but that is the price of using your stuff. I don’t see why it ALWAYS has to be my favorite mug that bites the dust. 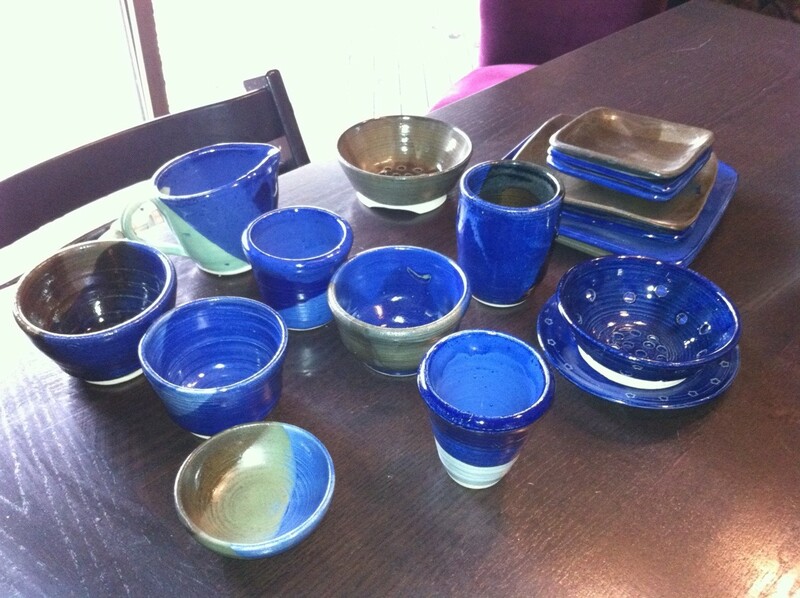 and that blue matches some of my fave dishes. LOVE these. wishing i was HALF as talented as you. i can make a mean list, though!